By the time we actually see another standalone Superman movie in the DC Extended Universe, it will have probably been at least six years since Man of Steel, which came out in 2013. Warner Bros. is going to make it happen at some point and Man of Steel 2 is in the development process. One of the next steps will be getting a director attached to help get the movie in shape and it looks like Jurassic World 2 director J.A. Bayona would possibly be interested in the job, should Warner Bros. come knocking. The director recently did an AMA on Reddit in order to promote his latest movie A Monster Calls, which is currently getting some serious awards season buzz. During the course of the AMA, J.A. Bayona revealed that the 1978 Richard DonnerSuperman was the first movie he ever saw and that helped him decided he wanted to be a filmmaker. Here is what he had had to say. "The first movie I saw in my life was Superman. I was three years old. The first memory I had was Christopher Reeve flying in the suit. Directing a Superman film would be great. I always wanted to be Superman. That's the film that made me want to become a director." We reported several months ago that Man of Steel 2 is in active development and that Warner Bros. is considering it a major priority moving forward. It also seems like Zack Snyder won't be returning to the director's chair for the upcoming sequel, so Warner Bros. will need to find someone who can. Occasionally, filmmakers can sort of will a project into existence by publicly expressing their desire to do it. So who knows? Maybe J.A. 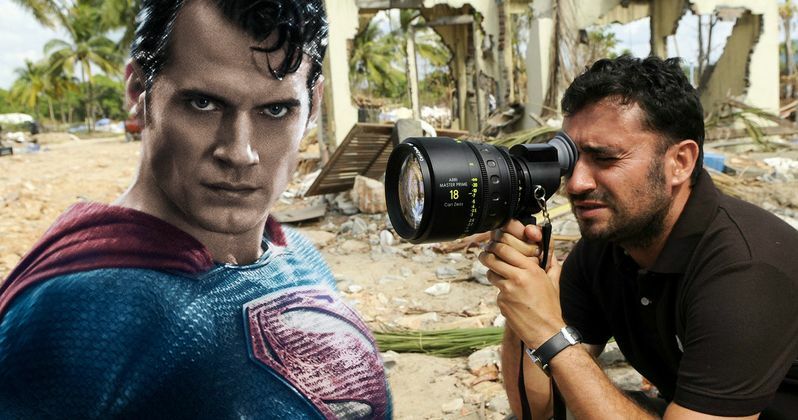 Bayona will wind up on the shortlist for Man of Steel 2. Assuming he does a good job with Jurassic World 2, he'll surely be in line for quite a few big jobs in the near future. He has certainly already made it clear he has talent with The Impossible and The Orphanage, as well as with A Monster Calls, by most accounts from those who have already seen it. As for Jurassic World 2, the movie is currently getting its cast together and readying for a production that is supposed to start next month. The movie will primarily be shot in the U.K. but will also be shooting some scenes in Hawaii, presumably because at least some of the movie will be taking place at the now surely closed down dinosaur theme park, given what happened in the first Jurassic World. Outside of that, we don't know much about Jurassic World 2 in terms of plot, but we do know that Chris Pratt and Bryce Dallas Howard will both be returning and that it won't just be dinosaurs chasing people around on an island. J.A. Bayona is taking over directing duties from Colin Trevorrow, who will be busy with Star Wars: Episode IX, but he is still producing and co-writing the script for Jurassic World 2. If we assume that J.A. Bayona at least makes a movie as good as the first Jurassic World, when you throw all of his talents in a blender, he seems like the perfect guy to tackle a Superman movie. He can do big action, he can do serious emotion and after Jurassic World 2, it will be clear he can make a massive blockbuster. The DC Extended Universe isn't exactly in the best of places after both Batman V Superman: Dawn of Justice and Suicide Squad failed to impress most critics and divided fans. Superman, specifically, has been treated poorly on screen in the eyes of many fans, despite having an actor in Henry Cavill who is very dedicated and seems like he was born to play the part. So having a guy like J.A. Bayona tackle Man of Steel 2 could be just what the DCEU needs. We'll have to see how things go with Jurassic World 2 first, which is scheduled for release on June 22, 2018.